Just start working, because you need something to work toward, something that is exciting and big. This past week, General Assembly launched a campaign called “Stop Talking. Start Making.,” a predecessor to its new online program, Fundamentals of Entrepreneurship. 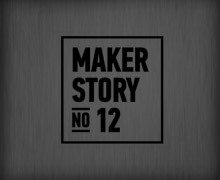 The campaign presents short video clips of great makers reflecting on how they moved past the pitch and just did it: they started their own businesses. The video spots feature David Kelley (founder of IDEO & Stanford’s d.school), Mario Batali (Chef & Restaurateur), Yves Behar (Founder of fuseproject), and other well-known, leaders and creatives. Quick cuts from one insight to the next left us both wanting to see more. They also inspired us to share our own story with you—about when we stopped talking and started making. Well, if you read Kern and Burn, you know I didn’t stop talking to people. In fact, I started talking to more people, and doing exactly what inspired me to finally make something I am passionate about. Our project proves that you should talk to your mentors. Listen to the stories of those who have done what you aspire to do. Hear what they have to say. Let them push you in new directions. Take their advice, or do the exact opposite. Either way, let them drive you to one thing: action. Watch “Stop Talking. Start Making.” Then, go out and make something great, and come back and tell us about it.